This is true and you can read it on the BBC’s internet site today: Jim Muir, Lebanon-based reporter and renowned tippler, reports that Syrian Lt. General Assef Shawkat, Deputy Chief of Staff of the Syrian Armed Forces, is seriously ill after being poisoned (while attending a security council meeting) by an “infiltrator”. He, at first, properly describes it as a rumor, but, then, in an act of pure professional self-immolation, admits that he has heard confirmations from “other” sources. Who are those sources? Let’s guess: Rami Abdel-Rahman, the wanted Syrian felon, agent of Qatar and MI6/Whitehall and notorious procuror? Hmmm. The non-local “Local Syrian Coordinating Committees” who have been able to capture the imagination of all anti-Assad freaks by pumping up their locations in Syria when, we all know, they are in Lebanon….maybe. My sources tell me they are in England filming at Pinewood Studios. Perhaps, the sources are in Mr. Muir’s mind? Or, like so many others today who are desperate for anything that sounds both credible and scandalous, Mr. Muir has opted for the Ouija Board! Lt. General Assef Shawkat is an educated man who is uniformly described as “refined” and “liberal”. 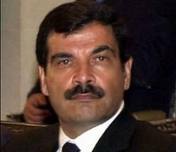 Besides being Deputy Chief of the Syrian General Staff, he is married to Bushra Al-Assad, sister of the president and apple of her father’s eye, the late president of Syria, Hafez Al-Assad. The story of the “poisoning” is actually an apocryphal re-editing of the original fable about an explosion which “killed” not only Lt. General Shawkat, but also, Syria’s Christian Minister of Defense, Lt. General Dawood Rajiha in the Al-Midan district of Damascus. When Gen. Rajiha refuted the somewhat “premature” tale of his death by actually appearing in the press and referring to the lie, something had to be invented to cover up the louse-ridden incredibility of the “sources” used by BBC, Al-Jazeera, CNN and the rest. Since Gen. Shawkat has not been seen recently, he must have “been poisoned”, they reasoned. Not true. I knew immediately the story was false, not only because Jim Muir had his scotch-soaked mitts all over it, but because no liquids or foods are offered to members of the general staff without first being tested by “preparers” who are absolutely loyal to the government. 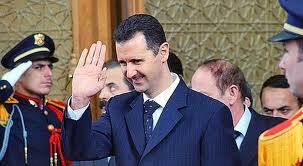 This is why it is virtually impossible to assassinate any high-ranking member of the Syrian government. I knew this when I met former Defense Minister Lt. General Mustafa Tlas in his home in Damascus in 1983. I had just finished visiting Hama and witnessing the rebuilding of two quarters there. General Tlas, seen here, was approaching retirement age in this picture. He is an aficionado of herbal teas. He also prints more books than Random House. He recently sent me an anthology of Classic Arabian Poetry through his daughter, Sarya Tlas, who has remarried and lives now in Damascus. In any case, why does the BBC keep printing folderol? There is an answer. It has to do with funding. The regime of David Cameron has made it pellucidly clear that if the BBC did not tow the line with British foreign policy as engineered by CIA psych-warfare strategists, the BBC would be sacrificed. The Prince of Catarrh has also weighed in with a nice “emolument” that convinced BBC staff that their future was better insured by “lying”, and, even worse: “believing its own lies”…..!!! 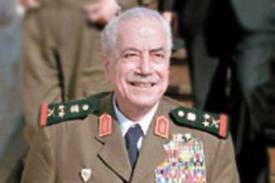 My sources in Damascus tell me that Gen. Shawkat has had “ordinary” medical tests for a man his age. He is not suffering from any poisoning. Too bad for the enemy. We look forward to having him back at his job, hale and hardy. Oh, and one more thing: At SyrPer we always love to menace our enemies. Once again, a photo of Dr. Bashar Al-Assad waving good bye to Nicolas Sarkozy, the degraded and humiliated former president of France: (Talk about Schadenfreude!). Ta ta, mon ami. Allez-vous a L’Enfer. Au revoire, O Menseur.